Sidney Farrar had at least two claims to fame: A daughter and a glove. The Ridgefielder helped create one of the 20th century’s greatest opera stars and played for one of today’s major league baseball teams in its very first years. Sidney Douglas Farrar was born in 1859 in Paris, Maine. By the 1870s, he was living in Melrose, Mass. where he was working in a box factory and playing semi-professional baseball for a local team. In 1880 he married Henrietta Barnes of Melrose, and two years later, their only child, Geraldine, was born. The first baseman started seven years with the Phillies and was better known as a good fielder than a strong batter or runner. His last major league season, 1890, was with the Philadelphia Athletics in the short-lived and rebellious Players League. Farrar had a lifetime batting average of .253, with 905 hits but only 18 home runs. 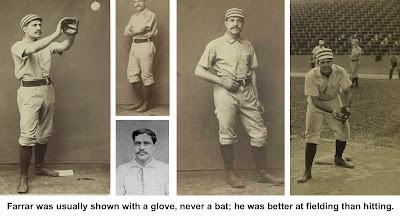 His best year was 1887 when he hit .282 and scored 83 runs. In 1888, he led the National League in being hit by pitches. In all, he played 943 games as a professional at a salary that ranged from $900 to $2,000 a season ($24,000 to $53,000 in 2016 dollars). One baseball historian reports Farrar eventually sold his interest in the clothing store and borrowed thousands of dollars to help pay for his daughter Geraldine’s singing instruction in Europe. Geraldine, who became a Metropolitan Opera star, owed not only her education, but at least some of her vocal talents to her parents. Both mom and dad reportedly had fine singing voices and performed a great deal in public, particularly with church choirs. “Farrar was a baritone, and it was said of him that if he was speaking in what, for him, was a conversational tone of voice on one side of a street, he could be clearly heard from the other side,” wrote Charles Paolino, a newspaper editor and historian. The Press said he convinced his daughter to move here and in 1924, Geraldine Farrar bought a place on West Lane. She lived in Ridgefield for the rest of her life here. Farrar became active in the community, especially with the Masons, and was elected a director of the Ridgefield Savings Bank. He “was ever a booster of this town,” said his Press obituary in 1935. When his estate was probated, his possessions included a 1927 Locomobile sedan and 200 shares of International Telephone and Telegraph stock, then worth about $1,375. Farrar Lane, off North Salem Road, was named for Sidney Farrar, whose farm bordered the road. The road, which existed long before Farrar moved there, may be the old southerly end of what is now Mamanasco Road.